In Q4 2017 I was pentesting a customer. Shortly before, I had studied json attacks when I stumbled over an internet-facing B2B-portal-type-of-product written in Java they were using (I cannot disclose more details due to responsible disclosure). After a while, I found that one of the server responses sent a serialized Java object, so I downloaded the source code and found a way to make the server deserialize untrusted input. Unfortunately, there was no appropriate gadget available. However, they are using groovy-2.4.5 so when I saw  end of december on twitter, I knew I could pwn the target if I succeeded to write a gadget for groovy-2.4.5. This led to this blog post which is based on work by Sam Thomas , Wouter Coekaerts  and Alvaro Muñoz (pwntester) . We'll start by exploring a popular mistake some developers made during the first mitigation attempts, after the first custom gadgets surfaced after the initial discovery of a vulnerability. Let's check out an example, the Jdk7u21 gadget. A brief recap of what it does: It makes use of a hashcode collision that occurs when a specially crafted instance of java.util.LinkedHashSet is deserialized (you need a string with hashcode 0 for this). It uses a java.lang.reflect.Proxy to create a proxied instance of the interface javax.xml.transform.Templates, with sun.reflect.annotation.AnnotationInvocationHandler as InvocationHandler. Ultimately, in an attempt to determine equality of the provided 2 objects the invocation handler calls all argument-less methods of the provided TemplatesImpl class which yields code execution through the malicious byte code inside the TemplatesImpl instance. For further details, check out what the methods AnnotationInvocationHandler.equalsImpl() and TemplatesImpl.newTransletInstance() do (and check out the links related to this gadget). The following diagram, taken from , depicts a graphical overview of the architecture of the gadget. So far, so well known. There is a try/catch around an attempt to get the proxied annotation type. But the proxied interface javax.xml.transform.Templates is not an annotation. This constitutes a clear case of potentially dangerous input that would need to be dealt with. However, instead of throwing an exception there is only a return statement inside the catch-branch. Fortunately for the attacker, the instance of the class is already fit for purpose and does not need the rest of the readObject() method in order to be able to do its malicious work. So the "return" is problematic and would have to be replaced by a throw new Exception of some sort. Ok, so problem fixed? Well, yes and no. On the one hand, the use of the exception in the catch-clause will break the gadget which currently ships with ysoserial. On the other hand, this fix is a perfect example of the popular mistake I'm talking about. Wouter Coekaerts (see ) came up with an idea how to bypass such "fixes" and Alvaro Muñoz (see ) provided a gadget for JRE8u20 which utilizes this technique (in case you're wondering why there is no gadget for jdk1.7.0_80: 2 out of the total 3 fixes mentioned above are already incorporated into this version of the class. Even though it is possible to bypass fix number one, fix number two would definitely stop the attack). Let's check out how this bypass works in detail. As you can see, the method starts with a call to defaultReadObject. After that, the instance attributes loadFactor and threshold are initialized and can be used. The key/value pairs are located at the end of the serialized stream. Since the key/value pairs are contained as an unstructured flat list in the stream calling putVal(key,value) basically restores the internal structure, what allows to efficiently use them later on. Coming back to AnnotationInvocationHandler, we can see that its method readObject follows this pattern. Since the problem was located in the custom code section of the method, the fix was also applied there. In both versions, ObjectInputStream.defaultReadObject() is the first instruction. Now let's discuss why this is a problem and how the bypass works. The fundamental insight is the fact that many classes are at least partly functional when the default attributes have been instantiated and propagated by the ObjectInputStream.defaultReadObject() method call. This is the case for AnnotationInvocationHandler (in older Java versions, more recent versions don't call this method anymore). The attacker does not need the readObject to successfully terminate, an object instance where the method ObjectInputStream.defaultReadObject() has executed is perfectly okay. However, it is definitely not okay from an attacker's perspective if readObject throws an exception, since, eventually this will break deserialization of the gadget completely. The second very important detail is the fact that if it is possible to suppress somehow the InvalidObjectException (to stick with the AnnotationInvocationHandler example) then it is possible to access the instance of AnnotationInvocationHandler later through references. During the deserialization process ObjectInputStream keeps a cache of various sorts of objects. When AnnotationInvocationHandler.readObject is called an instance of the object is available in that cache. This brings the number of necessary steps to write the gadget down to two. Firstly, store the AnnotationInvocationHandler in the cache by somehow wrapping it such that the exception is suppressed. Secondly, build the original gadget, but replace the AnnotationInvocationHandler in it by a reference to the object located in the cache. Now let's step through the detailed technical explanation. continue in the catch-branch, exactly what we need. 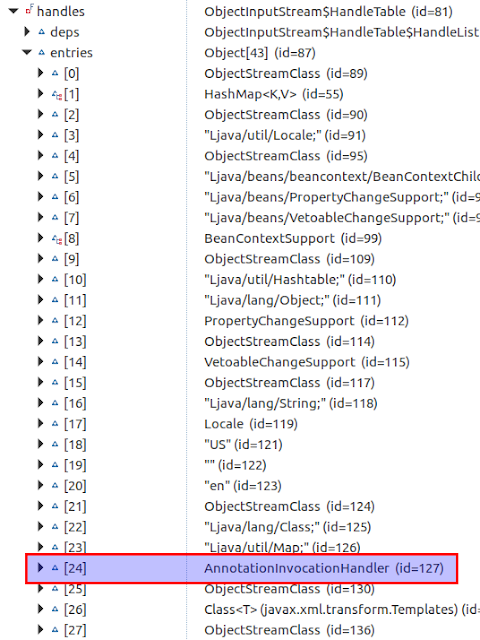 So if we can build a serialized stream with an AnnotationInvocationHandler as first child of an instance of BeanContextSupport during deserialization we will end up in the catch (IOException ioe) branch and deserialization will continue. 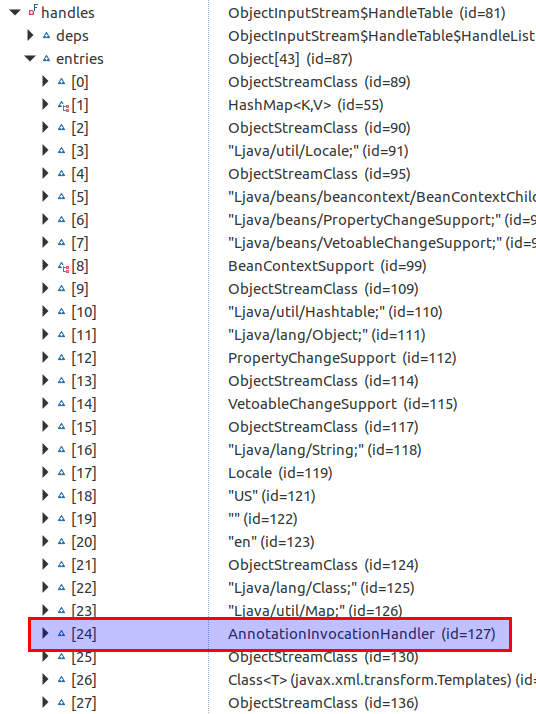 Once done, the deserialized object is a HashMap with one key/value pair, key is an instance of BeanContextSupport, value is "whatever". This concludes the first part, we successfully wrapped an instance of AnnotationInvocationHandler inside another class such that deserialization completes successfully. When we open it we can see that number 24 is what we were looking for. If you use a more recent patch level like Java 1.7.0_151 you will see that the attributes memberValues and type are null. This is the effect of the third improvement in the class I've been talking about before. More recent versions don't call defaultReadObject at all, anymore. Instead, they first check if type is an annotation type and only after that they populate the default fields. As you can see, the entry in the handles table can easily be referenced. Now we'll leave the Jdk7u21 gadget and AnnotationInvocationHandler and build a gadget for groovy 2.4.5 using the techniques outlined above. Based on an idea of Sam Thomas (see ). Trigger is readObject of our beloved AnnotationInvocationHandler, it will call entrySet of the memberValues hash map, which is a proxy class with invocation handler of type org.codehaus.groovy.runtime.ConvertedClosure. Now every invocation of ConvertedClosure will be delegated to doCall of the nested instance of MethodClosure which is a wrapper of the call to the groovy function execute. The OS command that will be executed is provided as member attribute to MethodClosure. Some readers might be confused by the fact that you can nest an object of type MethodClosure inside a KRBError. Looking at the code and interface of the latter, there is no indication that this is possible. But it is important to keep in mind that what we are concerned with here are not Java objects! We are dealing with a byte stream that is deserialized. If you look again at the readObject method of KRBError you can see that this class calls ObjectInputStream.readObject() right away. 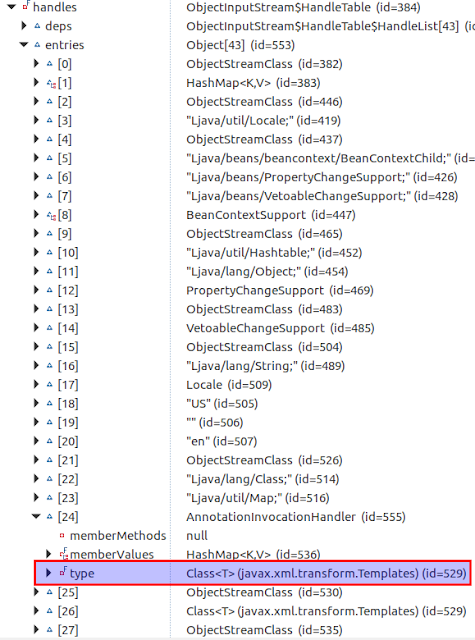 So here, every serialized Java object will do fine. Only the cast to byte array will throw a ClassCastException, but remember: An exception will be thrown already before that and this is perfectly fine with the design of our exploit. The final exploit can be found on github.com. As one can see, only the 2 last calls actually set the member attributes type and memberValues. defeaultReadObject is not used at all. Before, the type check for the annotation class is performed. If it fails, an InvalidObjectException is thrown and type and memberValues remain null.